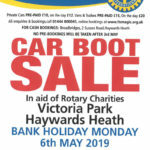 Bank Holiday Monday – In aid of Rotary Charities. Private Cars PRE-PAID £10, on the day £12. Vans & Trailers PRE-PAID £15, on the day £20. Admission by donation. A new piece of operatic theatre, written and performed by Erin Alexander, Soprano with Thomas Duchan, Accompanist. 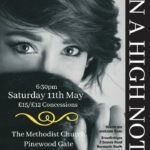 Tickets £15/£12 Concessions.